It’s the same dresser. The free dresser we got from our friend whose daughter used it in college. I think it could also be used as a credenza. We wanted to take it in a more modern direction. 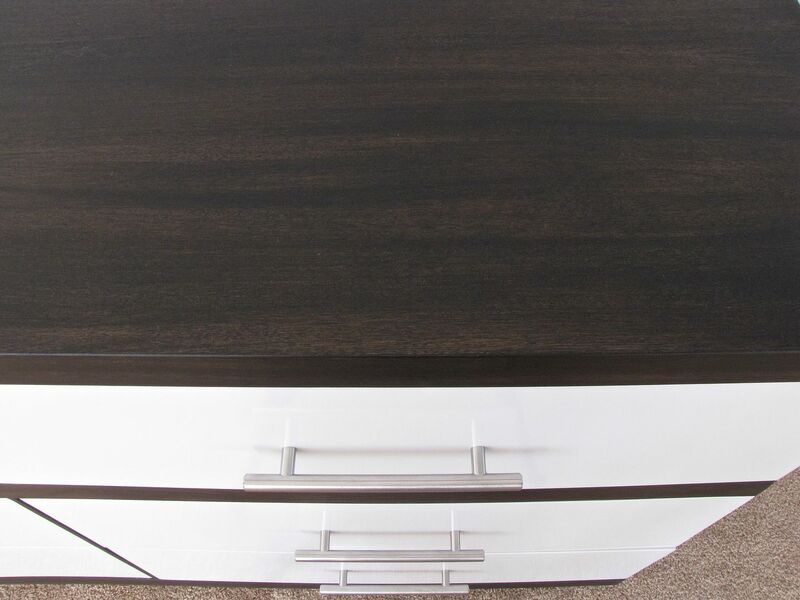 White lacquer with dark stained walnut (beautiful grain pattern) and a matte finish. Sleek and contemporary new legs and bar pulls in brushed steel. 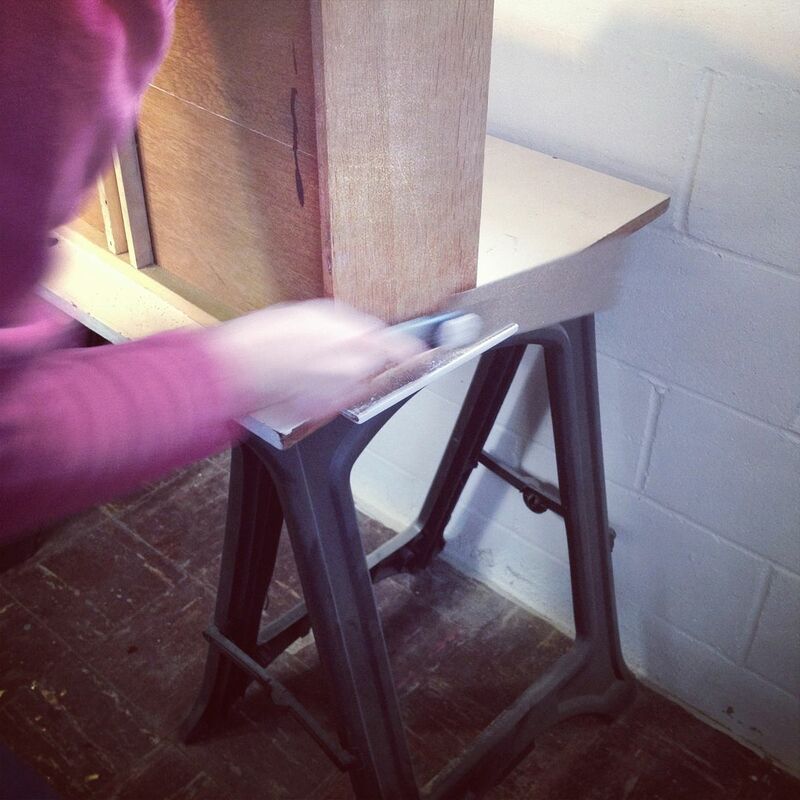 One obvious difference would be the addition of the steel legs which meant taking off the old base and filling the gaps in the top drawers with wood putty. 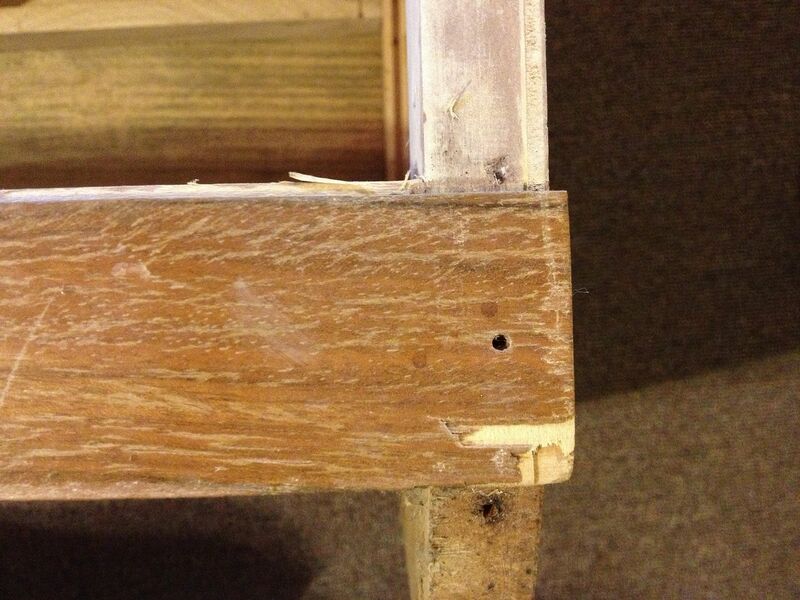 What you may not be able to see is that the veneer was chipped and marred on the drawer fronts but not so much the body. 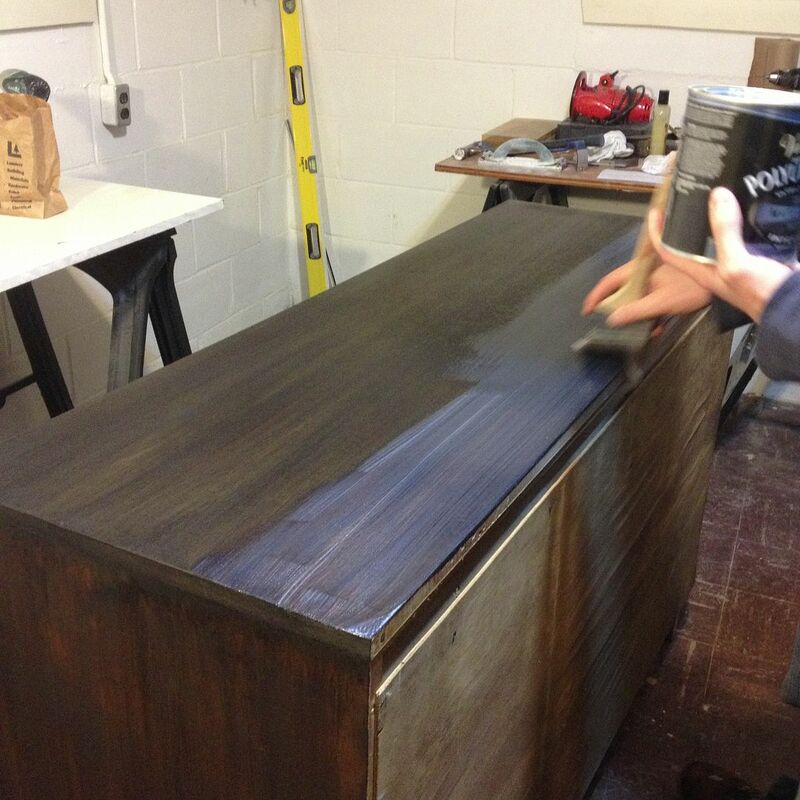 Finally a piece we could stain instead of paint (partially)! To get a smooth lacquer finish, we sanded our bums off, smoothed them out with wood putty, a coat of primer and several light coats of lacquer until we got the finish we were looking for (that took a few weekends of spraying in the garage during a cold Minnesota winter with time to cure in between in the basement). 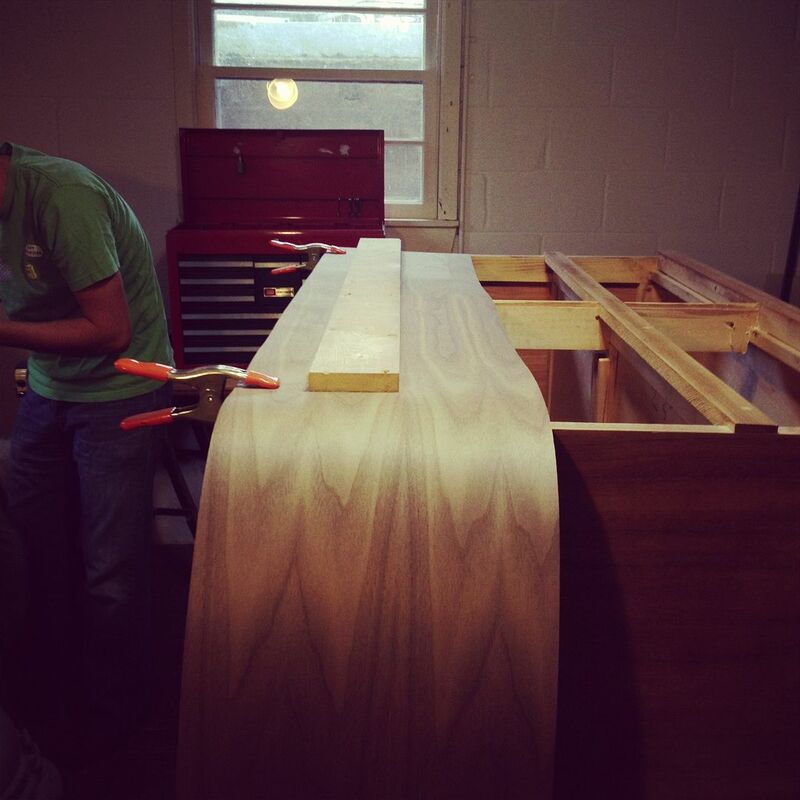 We also decided to buy new veneer that was as close to the grain pattern as we could get for the body. 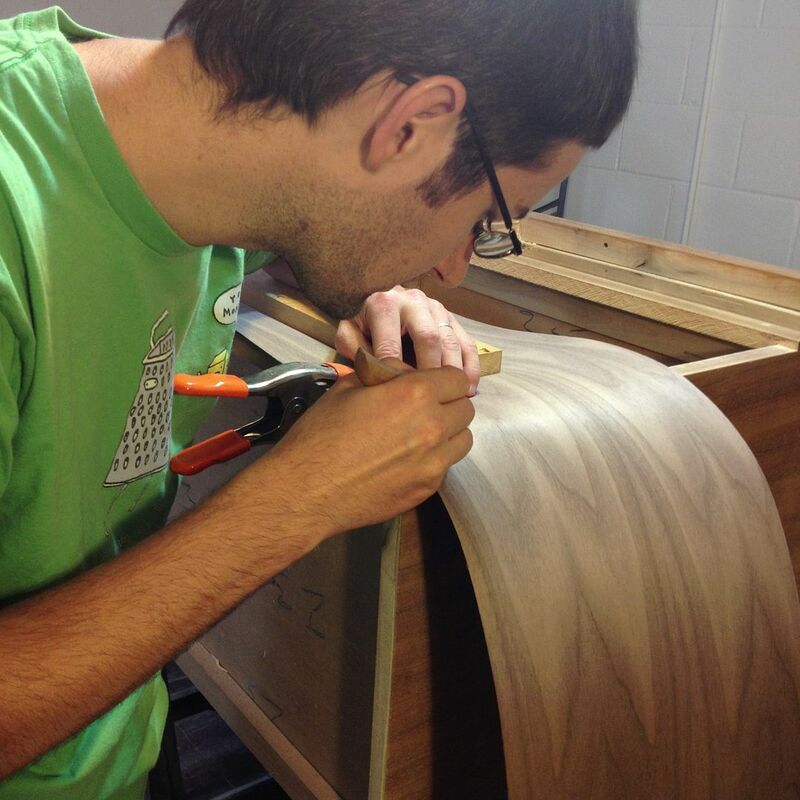 Most of what you see stained dark on the front is new veneer we cut, shaped and glued on. 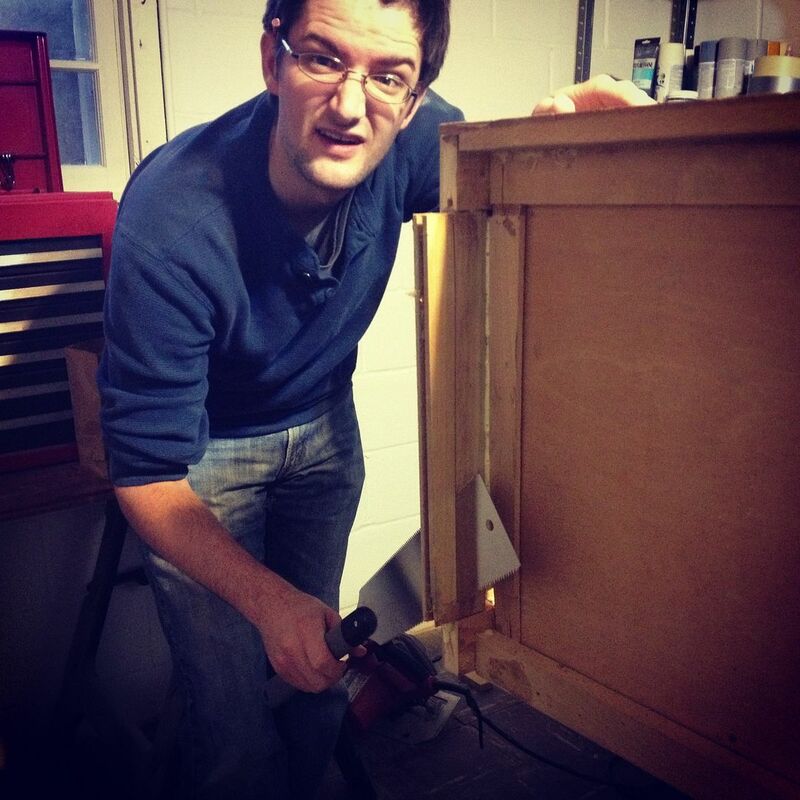 It was not as structurally sturdy so it got the “Greg treatment” to get rid of the wobbles. Ha, that is the face I love. Parts were added and taken away to achieve better support. These kinds of pieces tend to sag if they are not properly designed. 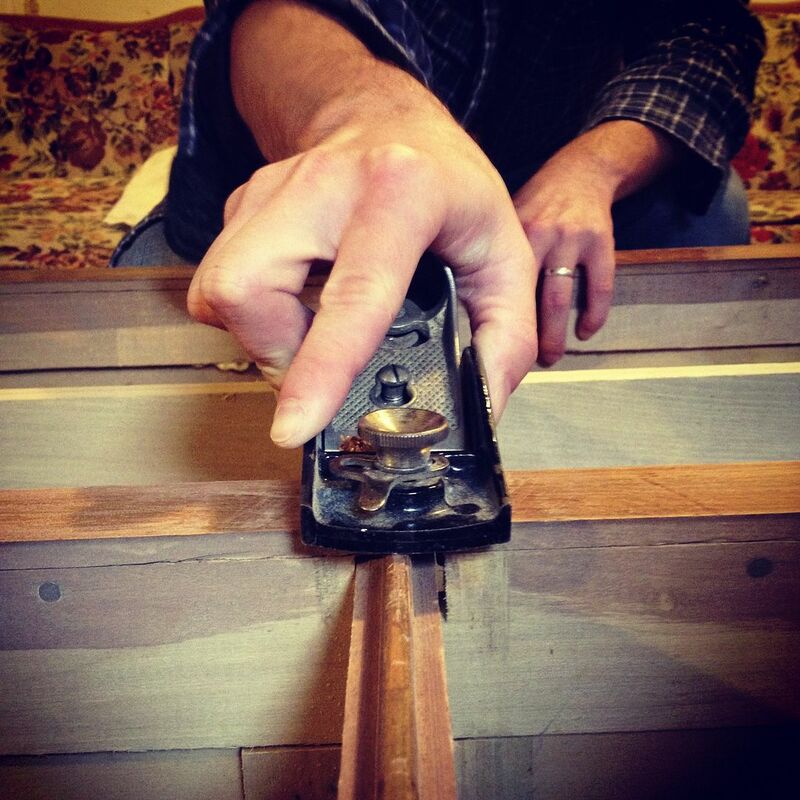 Drawer stops were put into their proper place to allow the drawer to slide in and out without scraping the sides or damaging the body as you often see in these older pieces. 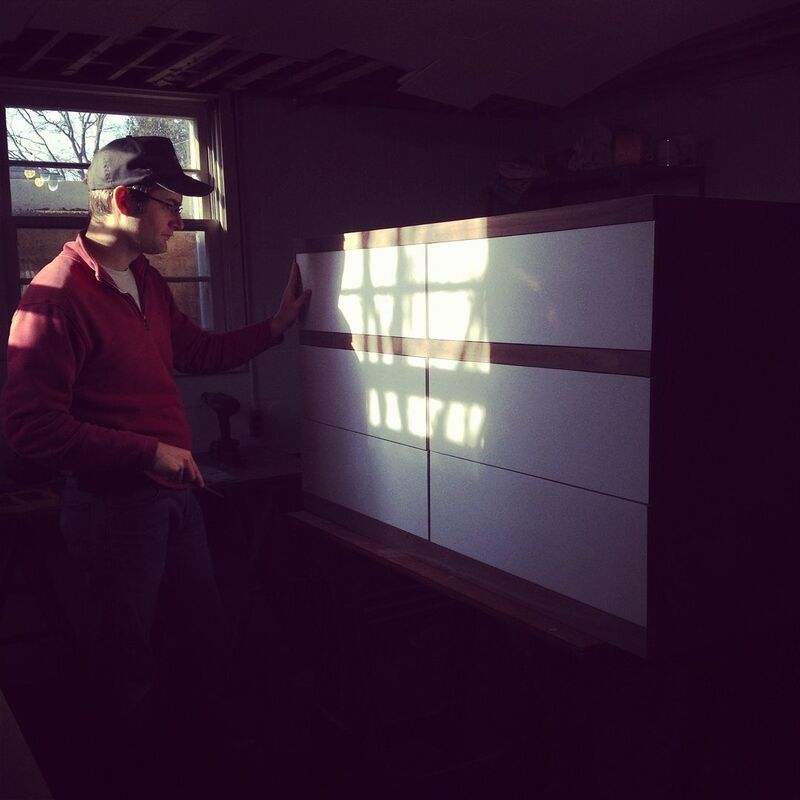 The sides of the drawers extended a bit beyond the body and we wanted the clean, modern look so they were chiseled, scraped and sanded to be even with the body. 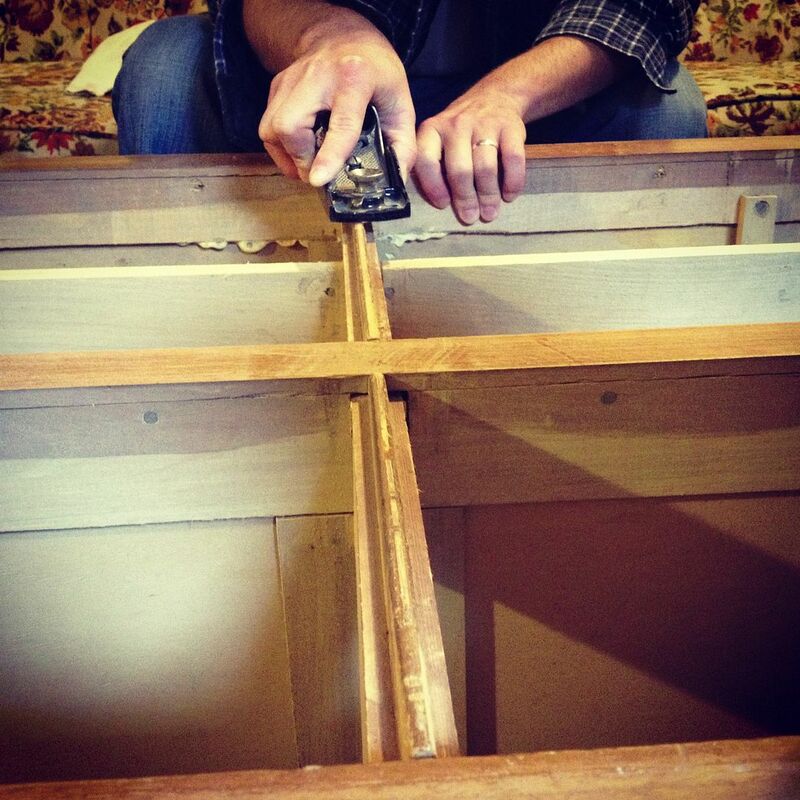 The stained strip down the front of the dresser, besides eventually getting new veneer, was hand planed to get rid of the rounded look in place of a smooth, flat front. Originally I wanted to do the opposite and lacquer the body and stain the drawer fronts because of their beautiful pattern but their condition didn’t make that possible. I think the finished look is glorious though but that could be the plan for a future piece. The high contrast between glossy lacquer and dark matte wood appeals to me. Always been a fan. 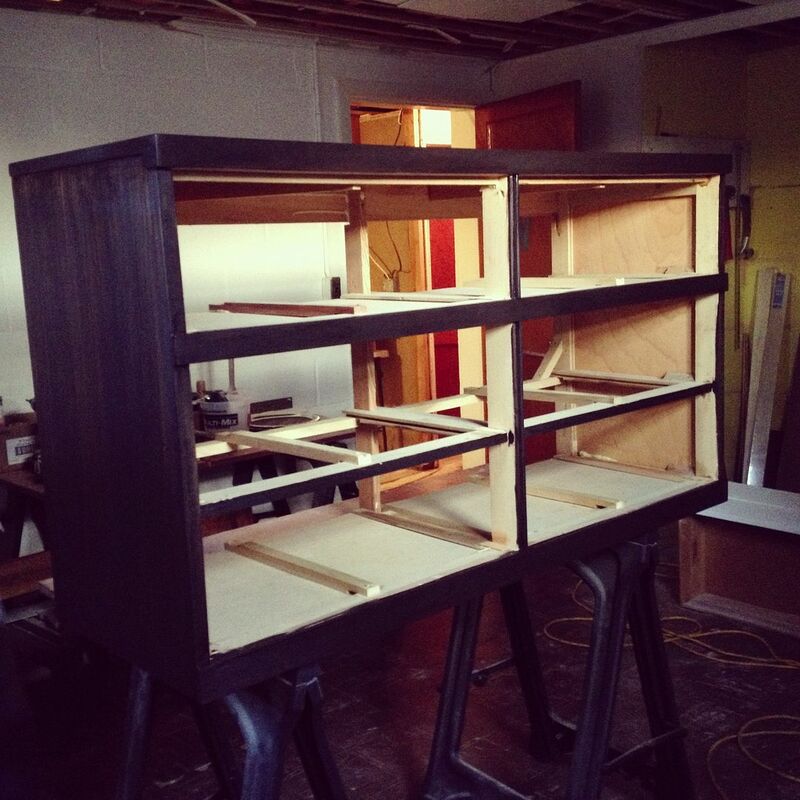 A few coats of gel stain (love the gel version) and a few coats of matte poly finish (also love), legs attached, finished glossy lacquer drawers added, hardware added, a sigh of relief that it’s finally finished and that it was just as we envisioned. A different style from what we’ve done in the past (for the most part) but something a bit closer and truer to our hearts and own style. 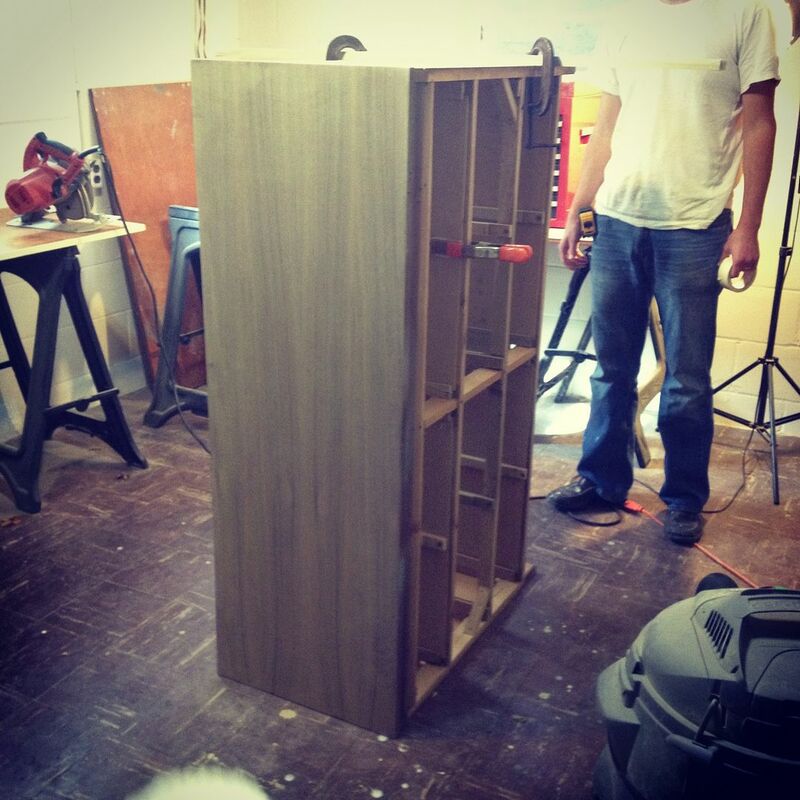 This piece stands as an example of design we adore creating in our quest to show our versatility as furniture salvagers. 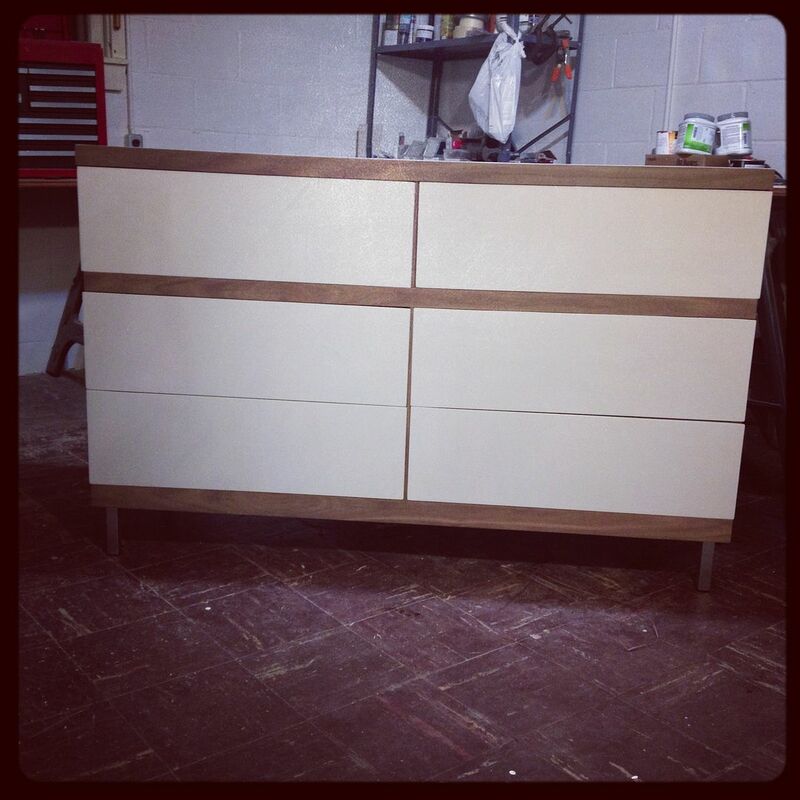 This entry was posted in Before and After, Dressers, Things We Made and tagged brushed steel, design, European bar pulls, furniture, glossy, lacquer, matte, mid-century, mod, modern dresser, pulls, refinish, salvage, stain. Bookmark the permalink. Oh wow Annie, this piece is magnificent! You guys did a fantastic job on it. Looks like it came right out of a high end furniture store! Way to go! Amazing!!! Great job!!! !I had to look twice, I couldn’t believe it is the same piece!! I just love it!. I love modern furniture. How did you do the metal legs? Thank you, Kelly! Oh yes, a ton went into this guy. So glad you stopped by! 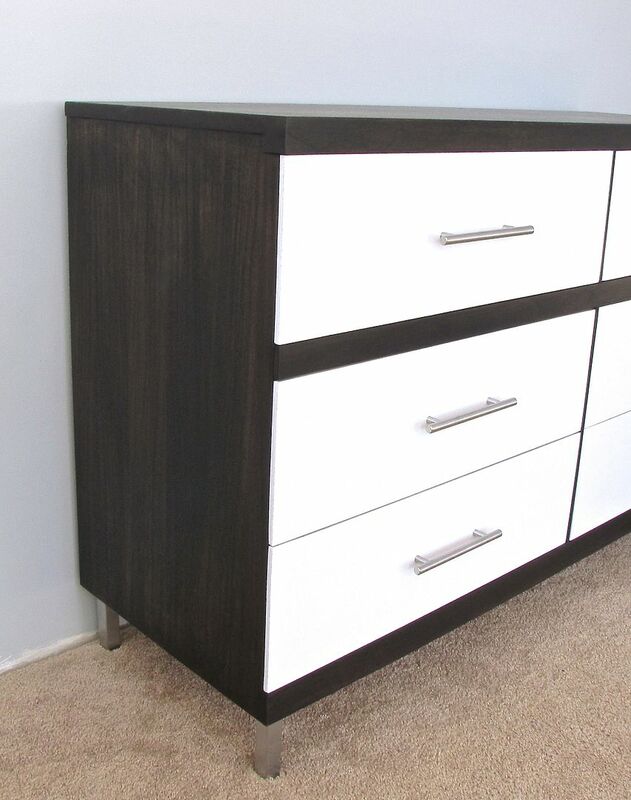 What paint/lacquer did you use to get the drawer fronts to that nice high-gloss look? 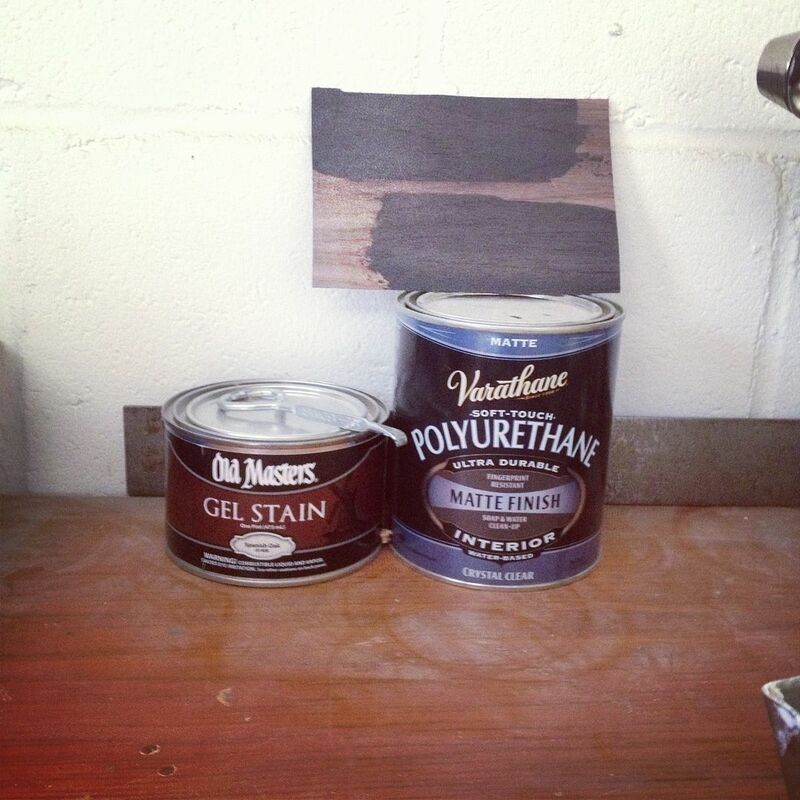 We used Rust-oleum’s spray version from our local chain store. 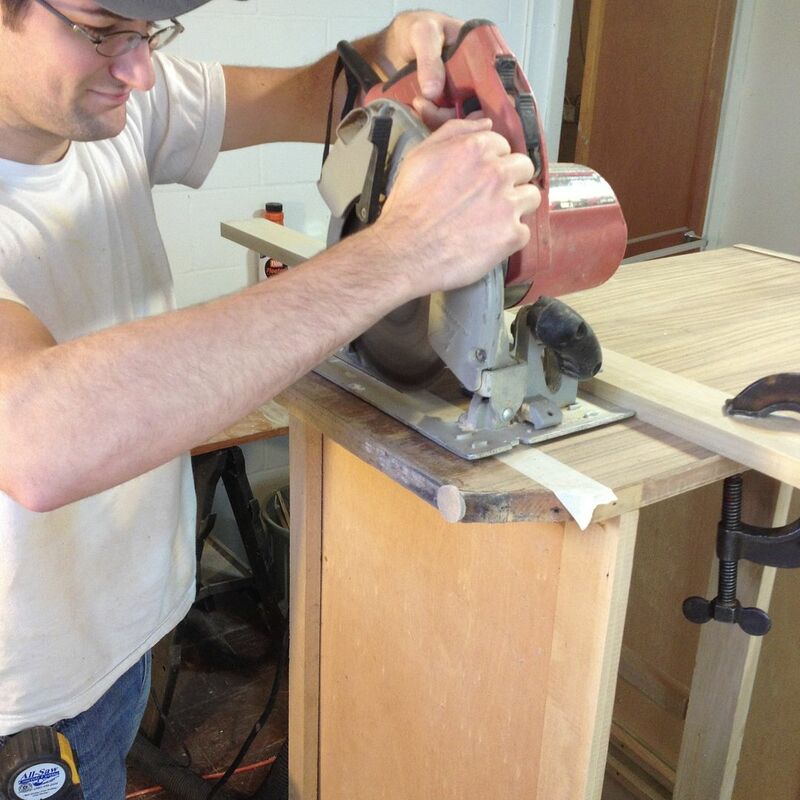 Nice and easy to work with on simple drawer fronts. Looks incredible! 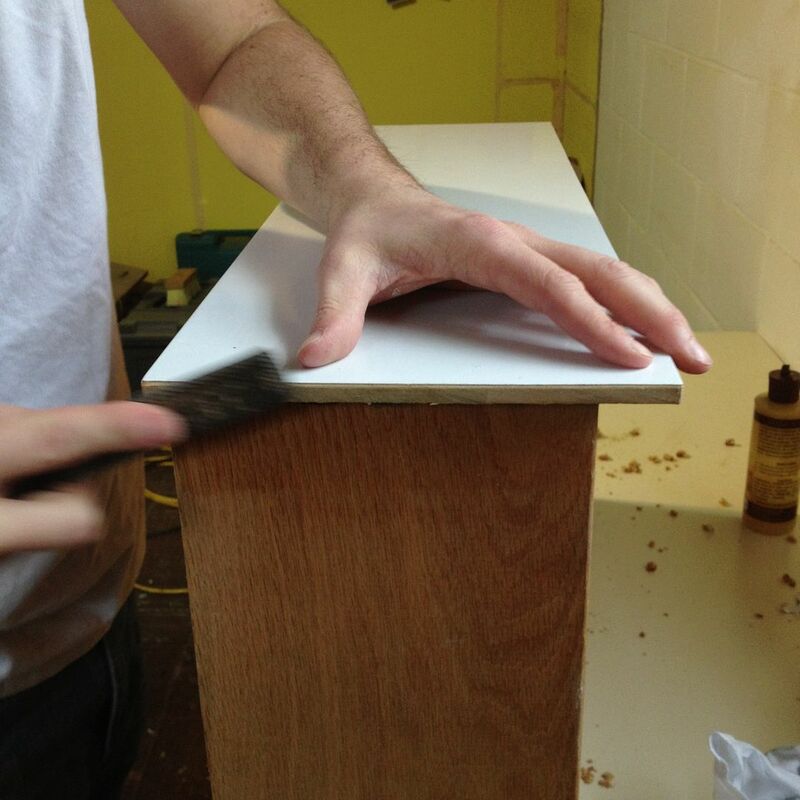 What wood laminate did you use, and was it applied with a heat-activated glue? Thank you! It was veneer actually and contact adhesive. 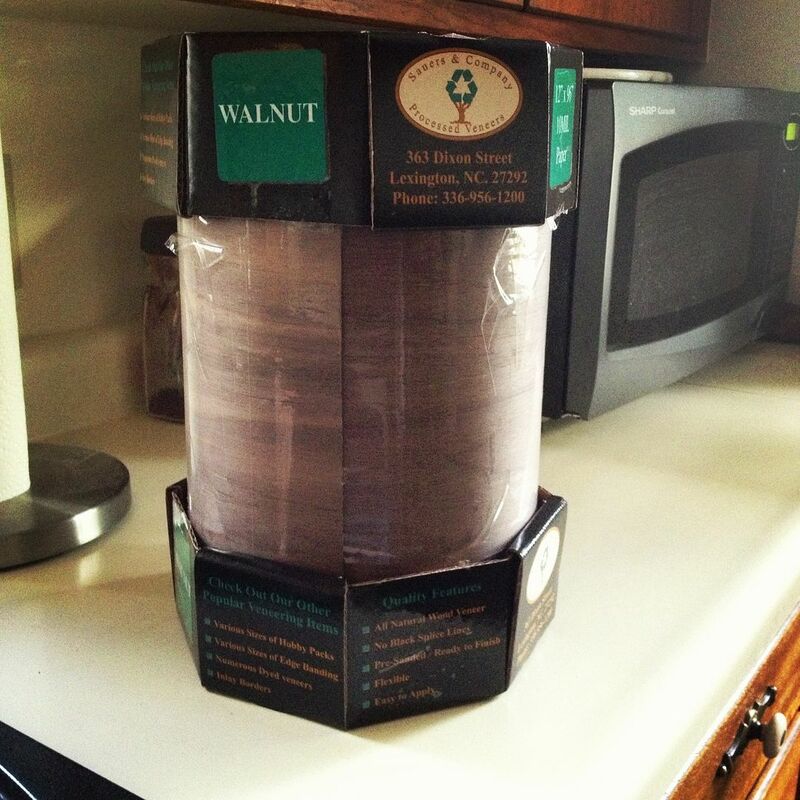 We tried to match the existing veneer and ended up with a walnut that came close. 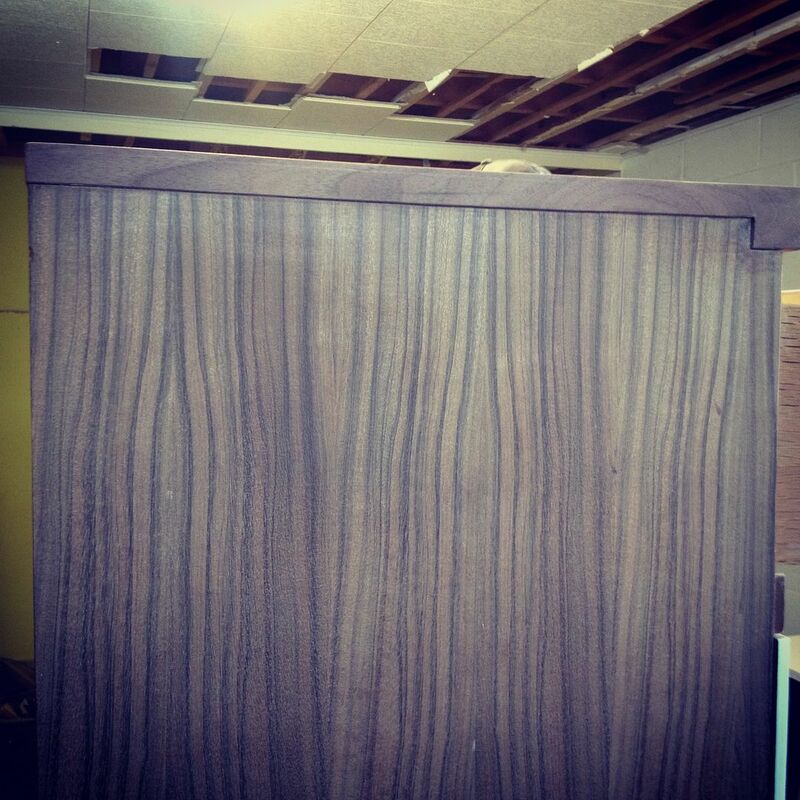 It was a beautiful and unusual pattern to the original veneer.